This large, colorful manual combines the history of an exotic cultural tradition with the biography of a remarkable man who has devoted his life to its practice and preservation. Born in American Samoa at the end of WWII and schooled by Mormons, Chief Pulefanolefolasa F. Galea‘i was “discovered” in his teens when he took up knife dancing, taught by his father. He soon became a sought-after performer in the posh hotels of Waikiki. Returning to Hawaii after an exciting career in US “show biz,” Galea‘i was inspired to raise cultural awareness of his Samoan traditions, founding the World Fireknife Championship and other notable festivals that maintain this ancient art form. Galea‘i collaborated with freelance writer Donna Manz in creating this informative coffee-table style guide. Ta’alolo (“pounding waves”) was a victory procession in which warriors carrying the head of a vanquished chieftain paraded towards their leader, knocking down, even killing, anything or anyone in their way, chanting, twirling their long, deadly nifo’oti (hooked knives, or “tooth of death”) and dancing the ailao (knife dance). In modern times, Samoans are not warriors, but these ceremonies are performed to honor distinguished visitors at joyful occasions. In the 1940s, fire was added by American Samoan performer Freddy Letuli and has been incorporated in the ailao, with flaming tips wrapped onto the knife ends. Practice for the dance is very dangerous; those new to the art use padded broomsticks until they can safely switch to metal weapons. 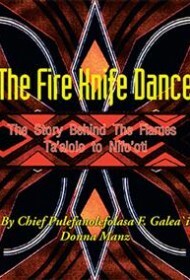 The Fire Knife Dance is filled with historical lore. The rules and judging criteria of the various contemporary competitions are enumerated, and modern color photos convincingly demonstrate the agility and athleticism of the men and women who practice the ailao today. Modern ailao performers owe a debt of gratitude to Galea‘i, who not only handcrafts special nifo’oti for the ceremonial art, but has proved himself a cultural ambassador helping to preserve Samoan tribal rituals. This book is another worthy step in that direction.